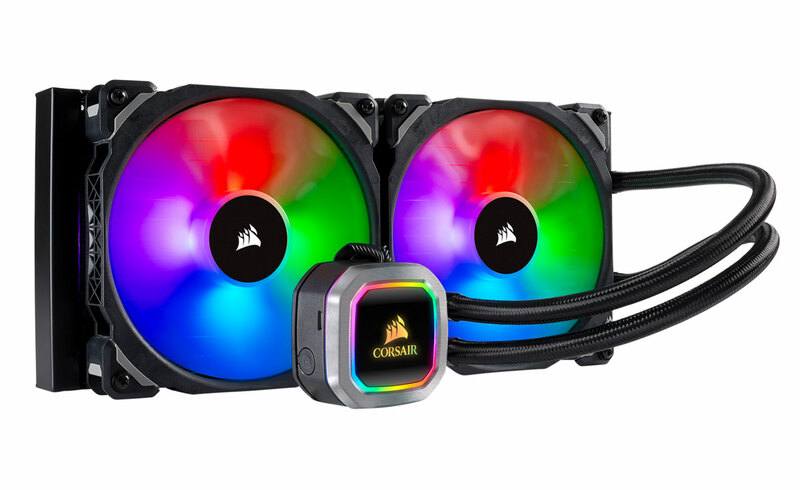 The latest-generation of Corsair's all-in-one watercooling loops have more RGB lighting than ever, with the fan blades and the waterblocks themselves festooned with customizable lighting options. It can make quite a dramatic difference to the look and feel of a PC, so could prove popular for those looking to upgrade their cooling and look of their PC in the same breath. The new Hydro coolers are the H115i RGB Platinum and H100i RGB Platinum and they're both dual-fan setups. The former is a 280mm radiator with a combined pump and waterblock for the CPU, while the latter is a 240mm all in one loop with the same pump and block combo. The H115i comes with a pair of 140mm fans attached, while the H100i sports the slightly slimmer 120mm design. The cooling difference between the two won't be astronomical, but the H115i should offer a slightly larger surface area for cooling purposes and with its larger fans, will likely be a little quieter too. According to Bit-Tech, the new waterblock design features an improved contact plate that is larger and more square, delivering better contact with some of the larger CPUs that have been released over the past year, like AMD's monstrous Threadripper designs. Both new coolers are available on Corsair's shop right now. The H115i RGB Platinum starts at $170, while the H100i RGB Platinum can be had for $160. Their non-RGB variants like the Extreme Series, can be bought for $140 and $120 respectively.